It is both easy and difficult to write albums for the same band in one week. On one hand you do not need to write another introduction for the collective, and hope the readers will read both, if they are into the band/genre in some form or shape. At the same time, the danger/fear is that you have used up all of the precious epithets and descriptives the first time around, so the second write-up might ring a little shallow. This will not be fair to the band, since those unfamiliar with the band heretofore may only seek an opinion for their latest work. 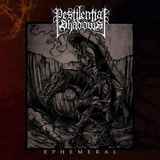 Thus, before providing you with my opinion on Ephemeral, just off the press album by Australian Pestilential Shadows, to be released on Halloween, no less, I have to repeat my earlier comments. Their 2011 album Depths is excellent, if dense gloomy black metal is your cup of tea. On Ephemeral Pestilential Shadows don’t change their stripes, and continue the push in the same direction, even if there were lineup changes apparently. One thing I noticed when Mill of Discord started playing after the mood-setting intro Throes, on Ephemeral Pestilential Shadows added more treble to their sound. Guitars on this album are even more penetrating, more cutting, and may take a little bit of time to get used to. Also, faster sections are almost completely eliminated, except on more experimental Sorrow of Tongues, which goes in every direction imaginable, from distorted twists to even some major (!) tendencies to bouncy and aimless running up and down the hill to the final closing descent. Most of the time Pestilential Shadows unfurl their banner of pain slowly. Hymn of Isolation and Suicide has an expansive ending to go with its all-telling title. The title track has some strange ambiance at the beginning, until sorrow and grief grow to a short-lived apogee around 7 min, dying its usual customary slow death afterwards. And on Fragments Pestilential Shadows songwriters demonstrate that they really understand how to weave melody through minor chords. The sequence can’t even be called repetitive anymore, but rather endless. Most importantly, throughout the whole album, Ephemeral is some of the most textured music you will ever hear. This is so dense you can feel its fibers drape around you like an enveloping cloth. The cloth which will make your shoulders droop and gaze be reduced to a blank stare. Ephemeral compositions are a little difficult to plug in mid-song, you have to ingest them start to finish. That, and perhaps the fact I have had a chance to experience Depths for much longer time, I prefer the predecessor to Ephemeral if ever so slightly.